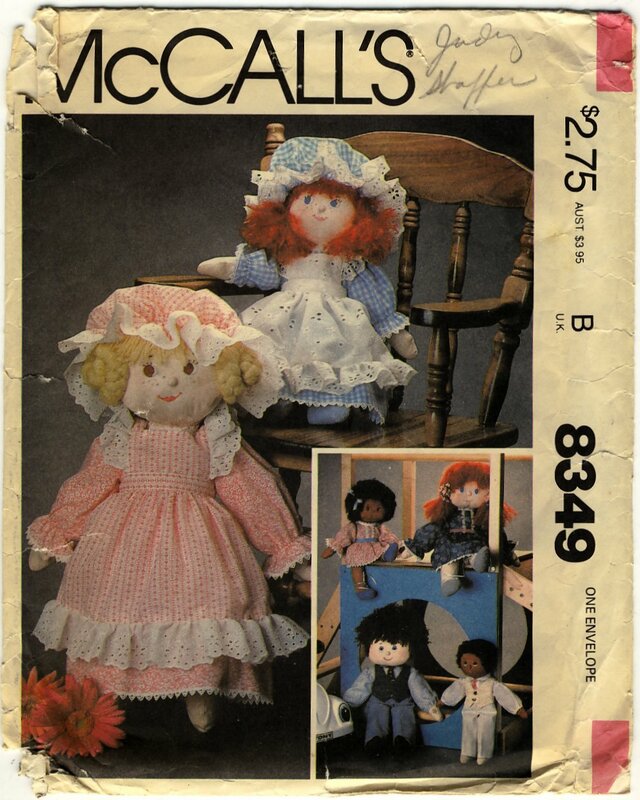 McCall's pattern 8349 makes a boy and girl doll in 17 1/2" and 13" sizes dressed in old fashioned styles. 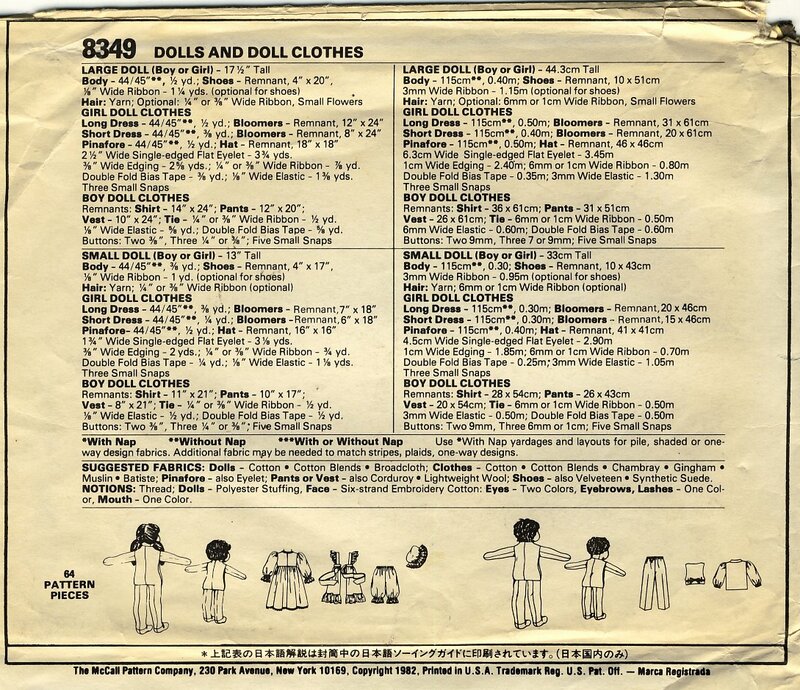 The pattern is copyrighted 1982. The dolls are made with a simple body in separated pancake style, with contrasting color feet to look like shoes, and mitten hands. The head has a flat face with a separate round stuffed nose; and the back of the head is in three pieces to give it a rounded shape. 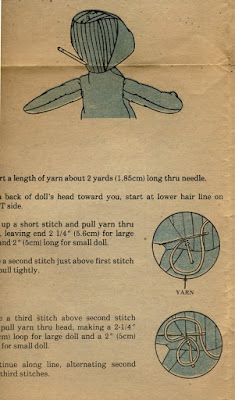 The girl and boy dolls are made with the same pieces, the only difference between them is the embroidered facial features, and the yarn hair styles. The girls' lace-trimmed dress can be made long or short. For the longer version, there is a pinafore and mob cap to give her a "Little House on the Prairie" look. The shorter version, without the pinafore, looks more contemporary. The boys' outfit is a shirt with gathered sleeves, pants with elastic waist, and a vest. These pieces could be used to make another girls' outfit as well. 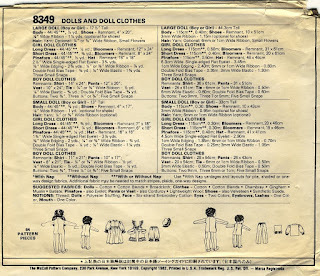 Although there is nothing unusual or exceptional about these designs, but the dolls are cute and the clothing patterns adaptable to a number of different looks. 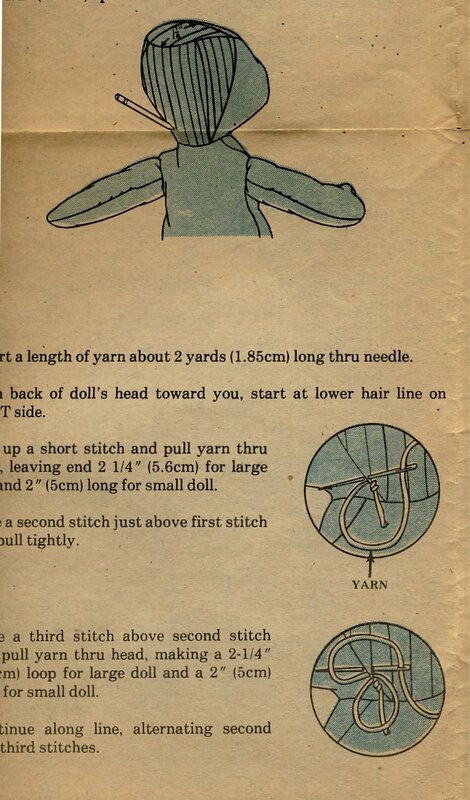 The instructions for this pattern are detailed, especially the page on hair styling, so this looks like a good pattern for a less experienced (or less confident) sewer.